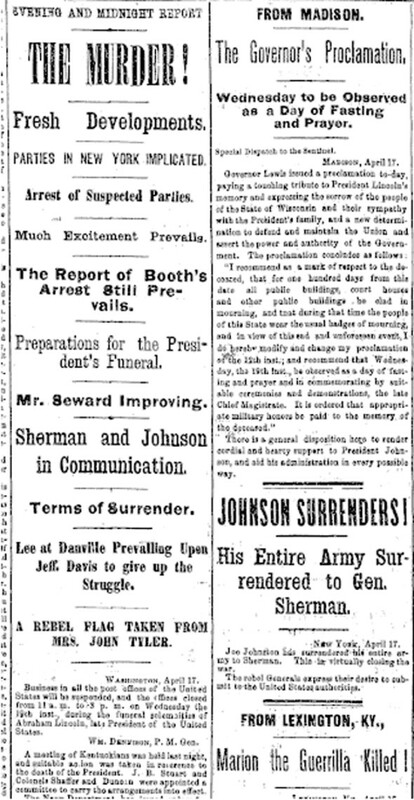 Among the various articles on the surrender of Confederate armies, Jefferson Davis, and reactions from around the country on the death of President Lincoln, there is one in particular that stands out. In the top right corner, Governor James T. Lewis makes known the people of Wisconsin of how they should respond in the wake of Lincoln's death. The people of Wisconsin, in accord with Lincoln's family, should remain in a state of mourning for a hundred days. This meant that local businesses and public buildings should be adorned in black, as well as a proclamation for a day of fasting and prayer on April 19, 1865. In remembrance of Lincoln, Lewis declares that all funerals and ceremonies should include full military honors. The short article ends with a showing of Union pride, as Lewis calls for the full backing of President Johnson's administration.